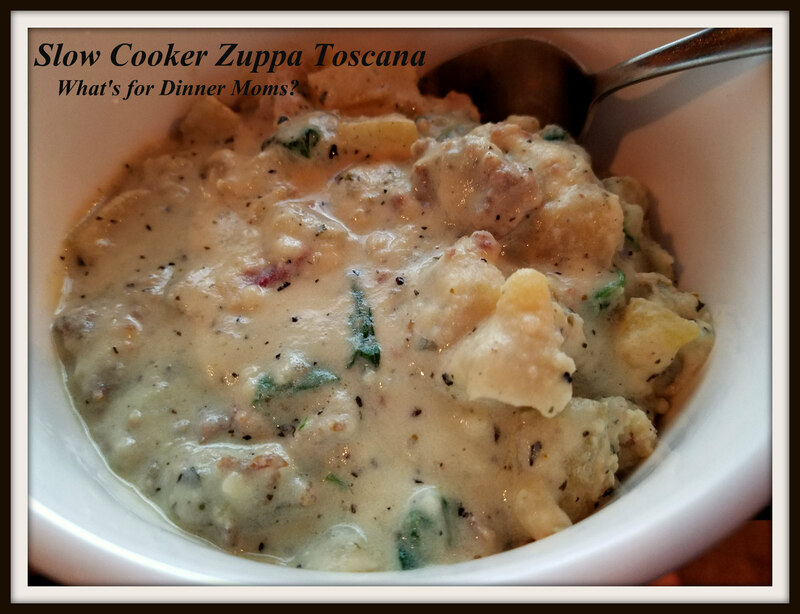 Slow Cooker Zuppa Toscana II – What's for Dinner Moms? This is a throwback Sunday recipe. I went back into my earlier blog posts and looked for something I hadn’t made in awhile to see how the recipe held up. Do I make it differently now, and have the ingredients changed for us? Like I encourage you to do I make these dishes according to my families tastes leaving out spices, adding spices, or other items such as onions, peppers, etc… Thinking I may make this a regular part of the blog. This recipe has changed just a little bit for us. I make it a big thicker now than I used to but other than that it is still pretty much the same. 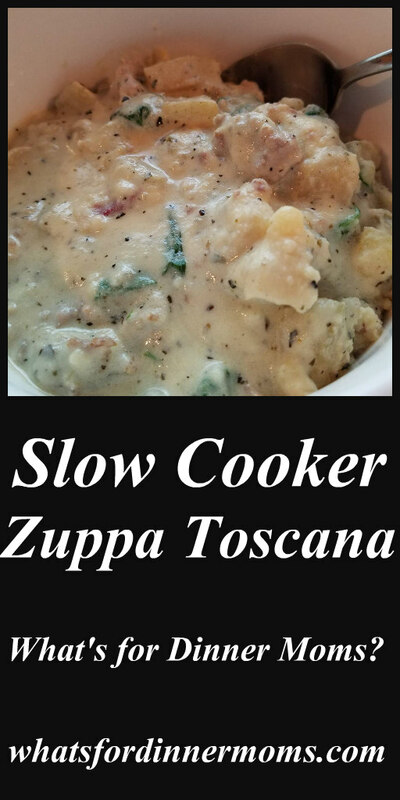 Slow Cooker Zuppa Toscana (click to view link to original blog post) has been a family favorite for quite a long time. We make it more of a stew now than a soup. If you prefer don’t add the potato flakes and the dish will be more soupy. It is all up to what you like! In a large skillet over medium heat brown the sausage and onion together. When the sausage is cooked through and the onions are tender, add the minced garlic and cook for another minute or two. (Don’t let the garlic brown!). Add the oregano, basil, and black pepper. Cook for another minute, then spoon this mixture into the slow cooker. Add the chicken stock, and the cut potatoes. Cook on low for 5-6 hours, or until the potatoes are tender. About one hour before serving add the chopped spinach, the cream, and if you like a thicker, chowder-like soup, up to two cup of instant mashed potatoes to the slow cooker. Continue to cook on low for about an hour. Serve in large bowls with fresh warm bread or garlic toast on the side, if desired. I love this kind of soups! Oh yum! Dinner tomorrow night celebrating our last snow fall! I think we are a few weeks out from our last snowfall! Hope you enjoy it!